The Christian Life is a life commenced in faith, continued in patience, and consummated by perseverance. It is a Divine life into which only those born again through the word of truth enter. It is an eternal life, for "I give unto My sheep eternal life and they shall never perish," says the Good Shepherd. It is possessed by every believer in the Lord Jesus Christ simply because he or she is a believer in Him. It is not at all an attainment, but the gift of God in Christ Jesus our Lord. It is not a renovation of human nature but a new life; not a mere reformation but a regeneration by God the Holy Spirit. Strictly stated the real Christian life is the life of Christ lived in the Christian. 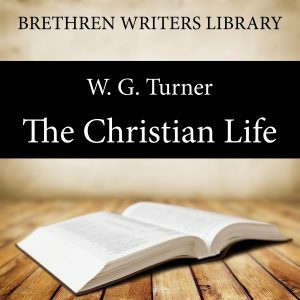 Here then, briefly, we review the open secret of the devotional Christian life:— Forgiven much, to love much too, Learning of Him, by listening to Him, Counting nothing too good for Him, Joyfully accepting His Lordship over the life. Have I been forgiven much? Do I love much?Have I chosen that good part? Do I hearken really? Do I know ought of the fellowship of His sufferings, being made comformable unto His death? Is His commendation more than all else to me? Do I practically own Him as Lord of my life? Do I do the things which He says? These are the questions which those who wish to know the joy of the Christian life must face for themselves. But Praise the Lord, we need not be alarmed, for we can count on Him to do exceeding abundantly above all we can ask or think, according to the power that worketh in us. ‘All scripture is given by inspiration of God, and is profitable for doctrine, for reproof, for correction, for instruction in righteousness’. WG Turner firmly believed that ‘whatsoever things were written aforetime were written for our learning, that we through patience and comfort of the scriptures might have hope’. In ‘The Christian Life’ we look beneath the surface in the old time Bible stories, where we can discern eternal principles enshrined in the narrative having a present application to ourselves. William George Turner was born in 1875 and called home aged 80 on 31st August 1955. He is buried at St. Nicholas at Wade, Thanet, Kent. As well as ‘The Christian Life’ he also wrote many other articles and is most well known for his book ‘Unknown and Well Known: A Biography of John Nelson Darby’. It is each Believer’s responsibility to grow in grace and increase in the knowledge of God, who has called us out of darkness into His marvellous light. It is our hope that in this format these writings may reach a whole new audience and lead to greater exposure for these precious truths of God. We pray that the rich mine of spiritual truths in their writings may be opened up to you that you may be built up in your most holy faith. Many of their writings are freely available online at Stem publishing.com.This edition is published with the prayerful desire that the Lord Jesus Christ will use this God-given ministry in this form for His glory and the blessing of many in these last days before His coming. Words by the Wayside, 2014.